Global stocks fell for a third straight day on Thursday as investor optimism about U.S.-China trade talks receded, while an early end to the U.S.-North Korean summit in Vietnam and weak Chinese economic data also weighed on sentiment. The Japanese yen and the Swiss franc, both safe-haven currencies, gained after the United States and North Korea failed to reach an agreement on denuclearization of the Korean peninsula after two days of meetings. 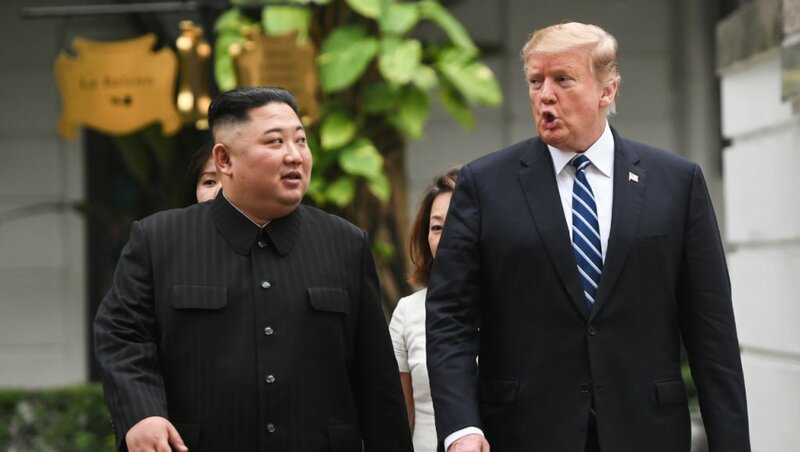 U.S. President Donald Trump and North Korean leader Kim Jong Un had constructive discussions on denuclearization, the White House said, but news of the summit’s early break-up triggered flight-to-quality bids in lower-risk assets. Riskier assets took a hit, with stocks across the board lower in Europe after the start of trading. The pan-European STOXX 600 index fell more than half a percent. “The abrupt ending to the Trump-Kim summit encouraged a little selling as it suggests that politics in the region isn’t as stable as previously thought, just like the U.S.-China trade situation – not as robust as investors had believed,” said David Madden, markets analyst at CMC Markets in London. The Chinese data also showed export orders fell at their fastest pace since the global financial crisis a decade ago, adding to worries about the nearly year-long trade dispute between China and the United States. U.S. issues with China are “too serious” to be resolved with promises from Beijing to purchase more U.S. goods, and any deal between the two countries must include a way to ensure commitments are met, U.S. Trade Representative Robert Lighthizer told U.S. lawmakers on Wednesday. Lighthizer said the office of the United States Trade Representative (USTR) was taking legal steps to implement Trump’s decision on Sunday to delay a tariff increase on more than $200 billion worth of Chinese goods that had been scheduled for Friday. But USTR later clarified in a statement that it was not abandoning the threat of increasing the tariffs to 25 percent from 10 percent. “This is likely to be the sort of trade deal that comes through: enough of a deal, or delays of further taxes to enable equities to stay supported while still allowing enough room for U.S. President Trump to criticize China on the campaign trail next year,” said Paul Donovan, chief global economist at UBS Wealth Management. Global equities had scaled a four-month high earlier this week helped by upbeat expectations about the U.S.-China trade talks. According to equity market analysts in Reuters polls, global stock markets in 2019 will at best only recoup losses from the deep sell-off late last year. They reckon the risk is skewed more toward a sharp fall by mid-year. In currency markets, the dollar index against a basket of six major currencies fell 0.3 percent at 95.834. The U.S. currency dipped 0.2 percent to 110.80 yen. The yen often attracts demand in times of political tensions and market turmoil. It showed little response to data showing Japan’s factory output posted the biggest decline in a year in January. The euro was 0.4 percent higher at $.1.14120 after slipping 0.2 percent on Wednesday. Britain’s pound was 0.1 percent lower $1.3297. Goldman Sachs on Thursday joined a growing number of banks and asset managers that reduced their probability of a no-deal Brexit. U.S. crude oil futures slipped 0.3 percent to $56.78 per barrel, losing a bit of steam after surging 2.5 percent on Wednesday.